The minimalist single family home Breeze House had Fran Silvestre as architect, Alfaro Hofmann as interior designer and PORCELANOSA Group as material supplier, with the Group’s companies L’Antic Colonial, Urbatek, Gamadecor and KRION participating in this project. Valencian studio Fran Silvestre Arquitectos is one of the most renowned studios at a national and international level, having been awarded multiple prizes including some of the most prestigious and renowned distinctions of the world of architecture and design, thanks to their impressive contemporary constructions. The Fran Silvestre studio is an expert in the KRION material, using it on the interior and ventilated facade of the award winning “Casa Balint” and on this occasion using it in kitchen countertop and bathroom unit transformations. 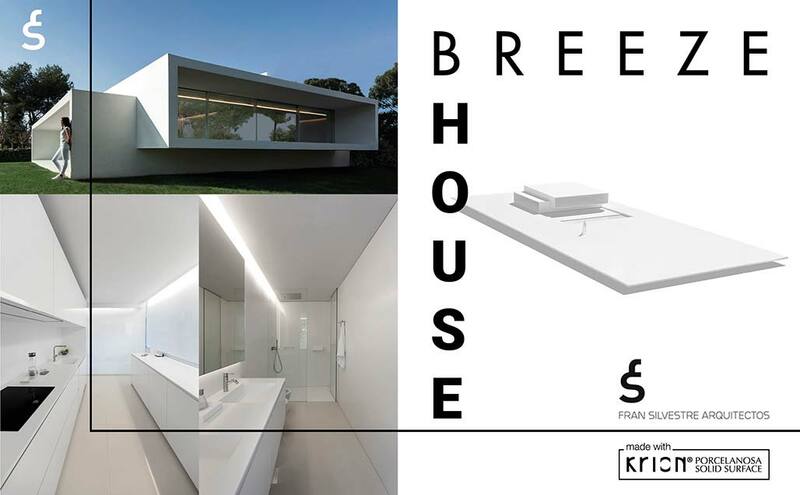 Breeze House is characterised by two cubic volumes which together form a single floor in which both the interior and exterior have the same white flooring, giving the sensation of a single room in which the products made with KRION 1100 Snow White blend into an elegant harmony maintaining the balance conveyed by the home.